For visitors' information, go to Medway Head Lighthouse on Facebook. There have been four lighthouses at this station. The first lighthouse was a square wood dwelling 23 feet high, painted white, with a black square daymark. This building was replaced in 1927 by a square two storey dwelling with a lantern atop the roof. This building was then replaced by a fiberglass tower in 1963. The house has been moved across the road and is now a private dwelling. (Not open to the public.) The current wooden pyramidal wooden tower 29 feet (8.8m) high was built in 1983 to replace the deteriorated fiberglass tower. The equipment to run the light is inside the tower. 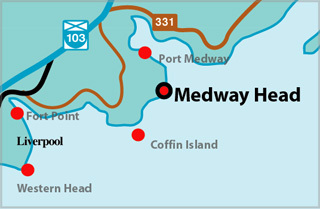 Medway Head Lighthouse stands on the west side of the entrance to Port Medway. "Given in Memory of Douglas Smiley By Roberta and Alden Wambolt"